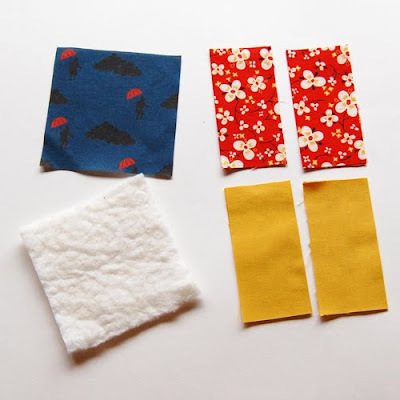 Here is the long awaited tutorial for the fabric coasters I have been making recently. I like it better than some other patterns I have done in the past because the final product doesn't need top stitching (though you could certainly add some if you wanted). These make a great hostess gift, so you may want to start stocking up now for all those Holiday functions coming up at year's end. To begin, you will need to cut out 5 squares of fabric per coaster (as you can see I generally use 3 different fabrics in each coaster- a bottom fabric and then 2 squares each of top fabrics). I use 4" squares, you could certainly go a little larger, but I wouldn't recommend making them any smaller due to seam allowances (you do want to be able to use them, after all). 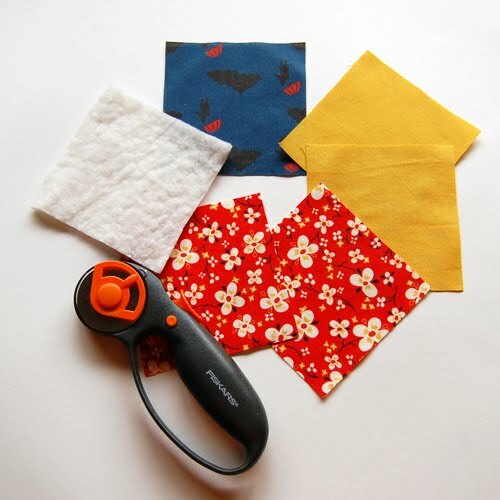 I also cut out a 4" square of cotton quilters batting (you could substitute felt as well, I recommend the polyester kind as it is washable). 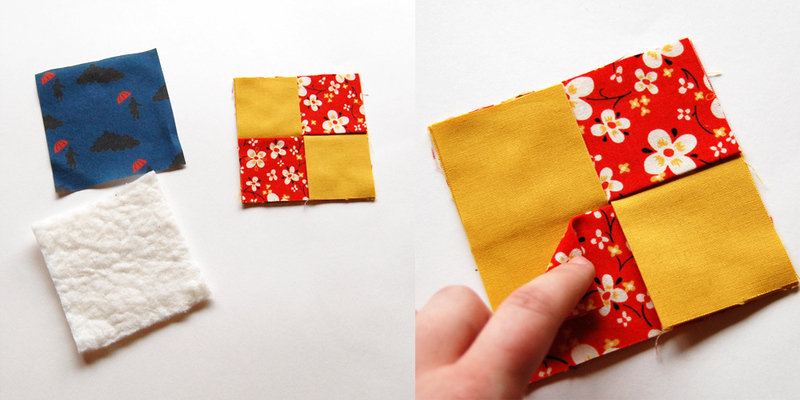 Once you have your piece cut out, you will want to iron each of your 4 top squares in half. Now you will have 4 strips that are 4" x 2", as well as your bottom and filling. Next, you will layer your strips to make your top coaster piece. If you are making a set and want to make sure your top layers look as similar as possible, I would recommend layering all of your coasters at the same time, this way you will know that you layered the yellow on top of the red (in this example) the same way each time. To layer, make sure your folds are all to the middle of your coaster and the raw edges are on the outside edge. 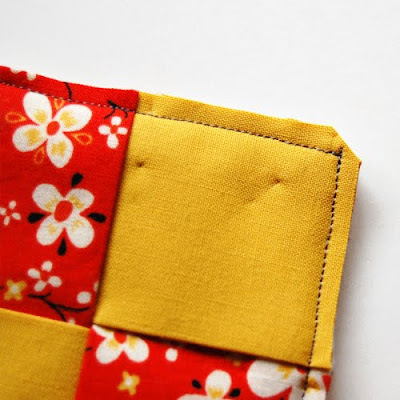 Try to get your fabric strips as snugly together in the middle as you can, if you leave large gaps you will be able to see your batting on the final project. 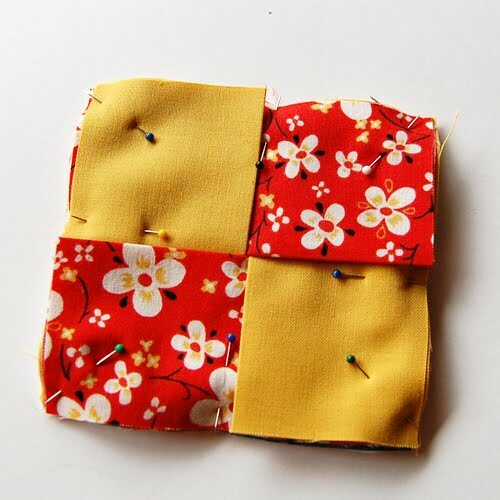 Once you have your top pieced together, you will layer your coasters to be sewn. Each coaster should have the batting or felt on the bottom, followed by your square of bottom fabric (wrong side touching the batting), and finally your woven strips (as pictured above). Pin each coaster together to prevent any movement while sewing. Again, make sure to keep your top strips as close together in the center as you can. Sew around the entire outer edge. You will be using the center of your coaster to turn out your final project, so no gaps need to be left for turning (and hence no top stitching will be needed!). Once you have sewn all the way around your outer edge, remove pins and clip off excess batting and fabric. As you can see, I cut off a little extra at the corners to make them less bulky in the final product. Finally, turn out your finished coasters and press them flat with an iron. I use a crochet hook to push the corners out more evenly. Voila! 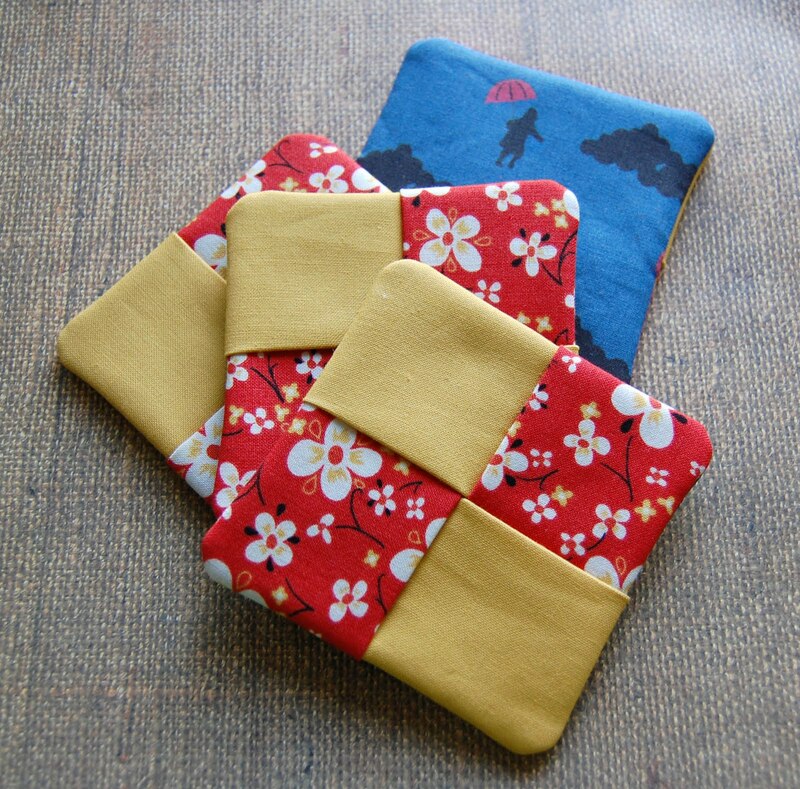 Quick and easy coasters with no top stitching needed! I generally use fat quarters and make matching sets, but you could make patchwork coasters out of any 4" x 4" scraps you have lying around. Squares not your thing? You could follow this tutorial with the same steps by cutting out circles instead (I might make my circles slightly larger, 5" or so) and make sure to clip around the edges before turning to get an smooth edge. I'd love to see any of the projects you make off the site! Feel free to join Craftinomicon on flickr! 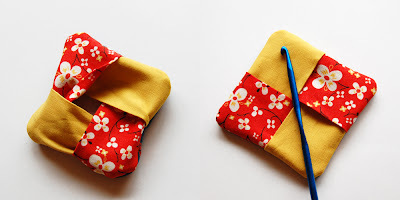 I'm totally going to give this a try even with my limited sewing skills. 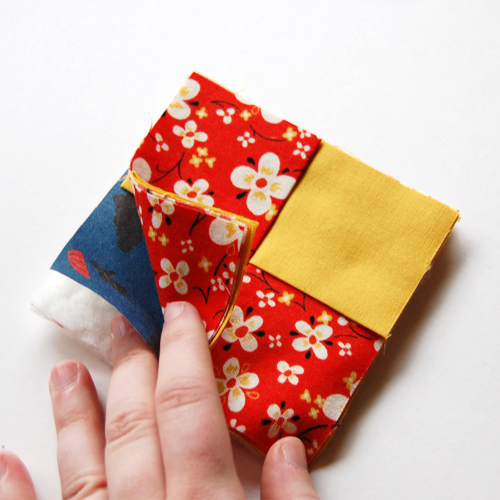 I recently happened upon one of those quilt kits with all of the fabric pre-cut into 4" squares, for free. This would be a perfect way to use of the kit as I know I probably won't be making a quilt out of them. I found these to be very easy. I added some fiber fill after putting together, then sewed a button on the top and bottom to make pin cushions. Thank you very much for the pattern. These are very nice. You can also fold your top fabrics on the angle then you have 4 triangles coming together in the middle for a different look. These are also great to nestle a wine glass bottom into. I made 6 of similar colors but each different so each wine glass was easily identified at a party. Just make sure you put it on your glass before pouring your pinot! I made these for family members for Christmas! Such a perfect little gift and it was easy! Just wondering - what was your seam allowance? Love these! I want to make several sets for Christmas gifts. Thank you! I used a 1/4" seam allowance on these, if you prefer a 1/2" allowance on your projects, adjust the starting squares to 4.5"x4.5". This is such a great idea! And your tutorial is very explicit, thank you! My side of the family is doing Christmas a bit late this year, so I had time to add to a gift. I thought I'd try up cycling some denim, so I made potholders and your coasters. Denim on the back, regular cotton fabric on the front. They came out super cute! While top stitching is not required, it does make the coaster lay flat and will help later when the coasters need to be laundered. I also happen to like the look of top stitching, but I know it's a hassle to some. Great tutorial, and easy to follow. Thank you!